Amasa Goodyear was an inventor, manufacturer, merchant, and farmer. Born in New Haven, Connecticut, on June 1, 1772, he spent most of his early career engaged in the West Indies trade—an endeavor he operated on a narrow neck of land in New Haven called Oyster Point. It was his ingenuity and inventive spirit, however, that eventually lured him out of merchant life and reshaped the nature of industry in the Naugatuck Valley. Goodyear recognized the value of water power in fostering the growth of manufacturing and subsequently moved to Naugatuck in 1805 to take advantage of the power offered by the river flowing nearby. By this time, his passion for invention had already produced the first closed lamp for burning oil. In 1807, he manufactured the first pearl buttons made in the United States, and three years later, he invented the spring steel hayfork. His manufacturing operations also provided the US government with metal uniform buttons during the War of 1812. Amasa passed his love for invention on to his six children and in 1821 went into partnership with his son Charles in developing and manufacturing new and innovative agricultural equipment. Seeing an opportunity to expand the business to growing urban markets, Charles moved his family to Philadelphia in 1826 and opened the first hardware store for domestically produced tools. 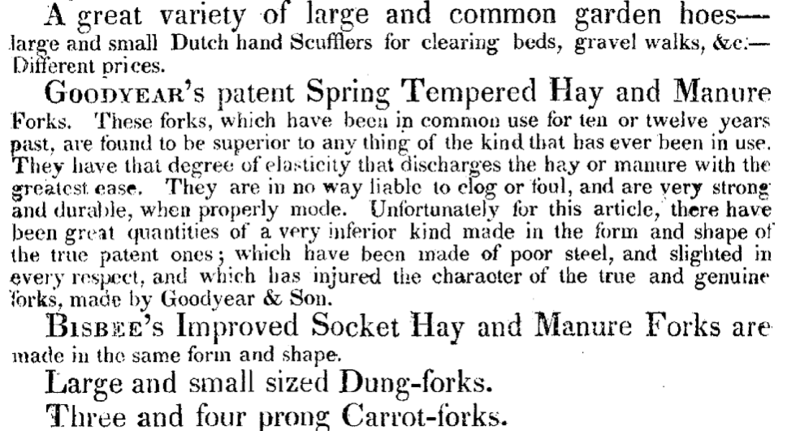 Many of the implements Charles sold had, until that time, only been available as imports from Europe. Unfortunately, Charles found himself unable to keep up with the demands of creditors and the business eventually went bankrupt. Always working on developing his next great business venture, Amasa moved to Florida with his wife Cynthia, son Amasa Jr., daughter-in-law Melinda, and granddaughter Harriet. There, he and his son grew produce for sale in the North. The venture soon met with tragedy, however, when yellow fever took the life of Amasa Jr. on July 1, 1841. Less than six weeks later, the disease claimed his daughter-in-law Melinda and, a week after that, his granddaughter Harriet. Amasa himself died of yellow fever just four days after Harriet. Despite his death in Indian Keys, Florida, Amasa Goodyear’s greatest legacy had yet to be realized back in Connecticut. In 1844, just three years after his father’s death, the bankrupt hardware manufacturer Charles Goodyear, channeling his father’s inventive spirit, patented his formula for vulcanized rubber. It was an invention that changed the face of manufacturing in Naugatuck and launched the Goodyear name into the lexicon of iconic American corporations. Kirkman, Grace Goodyear. Genealogy of the Goodyear Family. San Francisco, CA: Cubery & Company, 1899. Link.